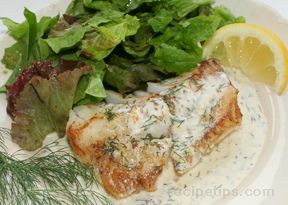 Cod or any mild flavored fish is enhanced by this rich lemony sauce with a hint of dill. Salt and pepper the fillets. Heat butter in a skillet large enough to hold fish in a single layer. When pan is hot, add fillets and cook about 5 minutes, turn and cook until done. Allow about 10 minutes total cooking time for each inch of thickness. 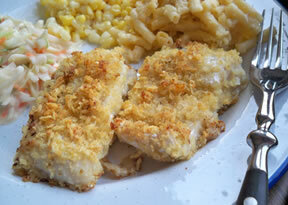 Remove fillets to a warm platter or individual serving plates. ( See TIP ) Add wine, zest and lemon juice to skillet, raise heat to high and bring to a boil. Add cream and dill and boil until sauce begins to thicken, 1 - 2 minutes. Add salt and pepper to taste and spoon sauce over fish. Serve immediately, with lemon wedges on the side. TIP: An easy way to warm plates: put them in the microwave with a small container of water. Heat for 1 -2 minutes and leave in oven until needed. Heat from the water will warm the plates. Make sure plates are microwavable, though! "This sauce has so much acid that is not edible, literally. Threw it all away." "Doing it again tonight, double recipe ... first time it was so good ... tonight I am using a Portuguese 'vinho verde' instead of a white wine, a little more acidity, I think ... will sprinkle a little of sugar, just in case. All ready for the stovetop action, I'm sure it will be delicious again!"